Some Mac users may encounter situations where they need to flush DNS cache in OS X for a name server to resolve properly, or for some DNS address change to become noticed by their individual computer. This is particularly relevant for system administrators, network admins, and web developers, but there are certainly situations where other users may need to dump and reset DNS caches too, like if a user has modified the /etc/hosts file and they need the changes to take effect without rebooting the Mac. Longtime Mac users will know that resetting DNS cache has changed in nearly every version of Mac OS X, and OS X Yosemite is no different, likely due to the discoveryd replacing mDNSResponder, and then switching back to mDNSResponder yet again. 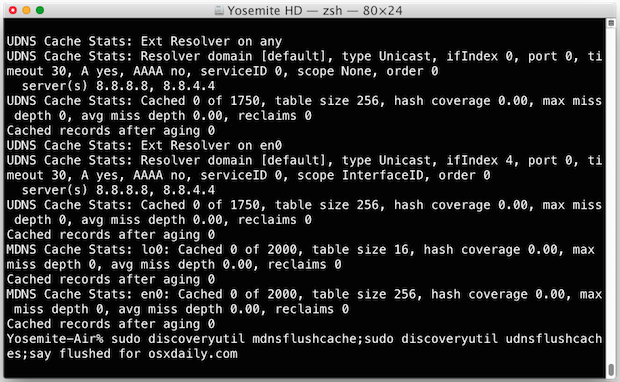 Regardless, flushing DNS cache in Yosemite remains a terminal command, but it differs slightly depending on the exact release you are using of the OS, and it actually allows you to clear either Multicast DNS or Unicast DNS, or both. You’ll probably want to clear both for good measure if you’re trying to reset all DNS caches on the Mac. That command flushes all DNS caches for OS X 10.10.4+. Longtime Mac users may recall that command string is basically what worked in the release prior to Yosemite. With that said, earlier versions of OS X Yosemite before 10.10.4 will use a different command string discussed below. You’ll need to use the Terminal to reset cache, you can find the Terminal app in /Applications/Utilities/ or launch it with Spotlight. To completely clear all DNS caches in the latest version of OS X, target both MDNS (Multicast DNS) and UDNS (Unicast DNS) with two different commands. Hit return and enter the admin password when requested. Again, hit return and enter the admin password when requested. Note that caches is plural with the latter command, a subtle but important syntax difference. Indeed MDNS and UDNS caches are different, but I’ve found that for functional DNS cache to actually clear in OS X Yosemite both commands are necessary. It’s entirely possible that you only need to clear one or the other for your own needs. For those wondering, OS X Yosemite has done away with mDNSResponder, so there’s no need to kill that mDNSResponder process to refresh DNS caches like in prior versions of Mac OS X. How do you know if it changed? dig is similar to nslookup, except that it has better output and a few more details included, included query time, the set DNS server used to access the domain, and a timestamp, all of which can be valuable when troubleshooting name server issues. By the way, if the query time for this shows up as sluggish, you should use a tool like namebench to find a faster DNS server for you, often Google DNS or OpenDNS. Know of another DNS cache trick for the latest versions of OS X? Let us know in the comments. Glad to know how to dump DNS in Yosemite and Mac OS 10.10 but i”m sure it’ll be different in OS X 10.11 and OS X 10.12 now. Oddly enough, the old one still exists! But, doesn’t seem to do anything, right? I do this and no cache flush? Yea, that’s right, I put them all in there for good measure. Flush that cache, baby! I need this sucker to work. Why does Apple keep changing the DNS reset tool? Keep us on our toes? It’s good to note the venerable Unix host, dig, and nslookup commands use different resolver mechanisms than most of OS X. When troubleshooting I usually compare with ping which gives the same results as the gui apps. I use VPNs to customer sites daily, and often need to debug the VPN sites local DNS not being used. When I find the DNS resolver works by testing with the host command, I cross check the same host with ping. If the results are not alike, it’s time to flush the DNS cache. THANKS Paul — your flush cache tutorial was the ultimate solution for the mysterious renaming malady that befell many Yosemite users after update. Previously happy host / computer names like ‘iMac-27’ suddenly and persistently became ‘iMac-27 (2)’ regardless of terminal encantations. Your flush cache suggestions have allowed my machines to run happy with their proper names for over 24 hours. I made the alias I like that idea. Thank you for this post very “to the point”. It is extremely helpful to myself who has really no knowledge of these things past os 9.. I checkout long ago. Thanks for making a simple copy paste situation. Appreciated! Tried using this method, but terminal will not allow me to enter my password. Any ideas? Terminal allows you to enter the password, just type it anyway and hit return. Terminal will not show you the password as it is being typed, that is a security precaution. Thank you for your reply, mtin. I am entering the password, but it just goes back to the main prompt. Have you sorted as I’m having the same problem. Same for me 10.10.4. Strange. Exactly what I need! Thank you! Thank you for this article. Very useful. Helped us get through the laptops but still the server is not responding. I can’t believe on Apple satidfaction survey. I reported 10 times this problem to Apple, last ticket is AppleCare No. 788196229, they never do nothing. I send to him all the information they ask to me in the mail confirmation of the ticket, I continue send mails to him and they never respond. Up to now I switch to Chrome (because It work fine even when Safari don’t) and next step is switch to another platform. You will find it has nothing to do with a survey, AppleCare, or a ticket, it is about flushing DNS cache on the Mac. It will impact all browsers, Safari or Chrome, after they have been relaunched. The server at monkeygodgame.com can’t be found, because the DNS lookup failed. DNS is the network service that translates a website’s name to its Internet address. This error is most often caused by having no connection to the Internet or a misconfigured network. It can also be caused by an unresponsive DNS server or a firewall preventing Google Chrome from accessing the network. Why all these descriptions about how to do what in different versions of what is now macOS? Basically just type it and hit return anyway, it is hidden intentionally.